There’s always been the danger that in concentrating on Schoenberg’s audience-friendly early works performers and concert promoters ignore the very substantial body of work that followed the breakdown of tonality and subsequent codification of his twelve-note method in his work. And indeed, placing this more ‘difficult’ repertoire in the context of his late-Romantic music goes a long way to aid understanding both of where he was coming from and where (and why) he was going. Yet while one may regret that room wasn’t found in a concert that offered barely 80 minutes of music for a palate-cleanser of, say, the Serenade or Wind Quintet, the London Sinfonietta’s traversal of some of the key works of Schoenberg’s first decade of maturity was both welcome and rewarding. Six of the group’s string players under the directorship of violinist Clio Gould began with a fervent but amply paced account of Verklärte Nacht. The musicians’ experience of playing in any number of different configurations led the ensemble to feel more like an orchestral string section pared down to single players than the usual quartet-plus or ad-hoc groupings familiar in performances of this work. Thus there was weight – aided by the full, resonant acoustic of Kings Place’s Hall One – and a more ‘orchestral’ sense to the texture that belied the number players involved, especially in the many instances where Schoenberg has two or more instruments playing the same music in octaves. Gould herself had a few moments where intonation went awry, but this was as much as anything to do with being swept up in the composer’s emotional sound-world. Tim Gill’s statement of the big, Dvořák-like melody when the music magically glides into the major mode was warm yet imposing, and the subsequent music of transfiguration was atmospheric in its ethereal duetting between cello and violin. 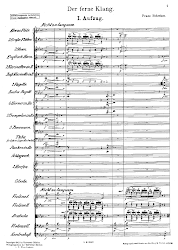 However, one misjudgement was the elevation of Gill’s subordinate theme at the Etwas bewegt before the piece’s last big climax to the foreground, which stuck out uncomfortably and masked Gould’s principal line above. It is true that Schoenberg’s dynamic markings here are not that helpful, but by the time of his later string-orchestra version he had adopted his distinctive marking of Haupstimme/Nebenstimme and indeed labels the violin ‘P’ and the cello ‘S’ (in this American-era publication standing for principal and secondary). It was one moment of unease, though, in a performance of integrity and power. For the concert’s second half, the strings were joined by wind, brass, piano and harmonium for Schoenberg’s own chamber-orchestra arrangement of the ‘Song of the Wood Dove’ from Gurrelieder. With the estimable Sarah Connolly as soloist this was luxury casting indeed, and the piece came across less as a ‘song’ than as a fully fledged dramatic scena, so vivid was the mezzo’s projection of the text and its heartfelt sentiments. Her security and evenness of tone from passages below middle C to a thrilling top B flat on the crucial word ‘Tod’ were marks of what makes her such a sought-after and wide-ranging artist – by no means hemmed in by stereotyping as a ‘Baroque specialist’ and now, of course, an experienced Wagnerian as well. The concision of Schoenberg’s original, vast orchestra into such a small instrumental ensemble is a masterpiece in itself, and Nicholas Collon drew all the colour he could from the 17 players at his disposal. The neat dropping of piano and harmonium from that ensemble left us with the exact configuration for Schoenberg’s First Chamber Symphony, the final work in this programme. Collon here drove the music hard, at times making us wonder if it was ‘Sehr rasch’ or just rash. But the players of the Sinfonietta seemed up to anything as ever and the performance celebrated their collective virtuosity as much as the composer’s fecundity of imagination, contrapuntal ingenuity and textural flair.